Large market opportunity—can the company grow to 5-10x its current size? Strong and incentivized management—I like companies led by a founder, family or long-tenured CEO with a vision. High return on capital or potential return on capital. In an early stage company, this may indicate that the unit economics of attracting a customer versus the value of that customer are elevated. This also translates to a strong competitive position. This write-up is the first in a series of Growth Factor updates exploring private companies that have recently sparked my interest. Virta Health’s mission is to reverse type 2 diabetes in 100 million people by 2025. This mission is about as big as it gets. There are 400-500 million diabetics worldwide. The United States spends over $300 billion per year on care for diabetics—to say nothing of the spending on other chronic diseases where diabetes is a contributing cause. To take the mission beyond economic and medical statistics, and to something we all understand, there are 295 amputations done every day on diabetics in the United States, according to the American Diabetes Association. Virta is based on the research of Co-Founders Dr. Stephen Phinney, Chief Medical Officer, and Dr. Jeffrey Volek, Chief Science Officer. Co-founder and CEO Sami Inkinen recognized that technology could be used to scale and change the care delivery model for diabetes. The company prescribes that people eat real food and minimal carbohydrates. We now have solid scientific evidence that sugar and processed carbohydrates actually change the biochemistry in our bodies, so that we crave more, eat more, gain fat, and develop insulin resistance and diabetes BECAUSE of our over-exposure to sugar. Virta also recognizes that the care delivery model of occasional doctor visits hasn’t worked, and this model won’t scale for reversing diabetes. Instead, Virta provides continuous remote care by a physician-led team. These teams are enabled by technology and artificial intelligence. 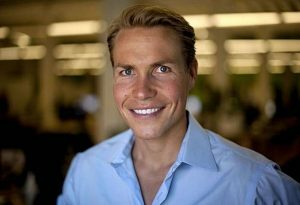 I met with Sami Inkinen, CEO, in Virta’s San Francisco office. They occupy a good bit of a WeWork space on Mission Street. Sami co-founded Virta with Dr. Stephen Phinney and Dr. Jeff Volek in 2014. In 2011, Phinney and Volek published The Art and Science of Low Carbohydrate Living: An Expert Guide to Making the Life Saving Benefits of Carbohydrate Restriction Sustainable and Enjoyable. They have done years of research with a focus on metabolic health and insulin resistance. Sami saw the market opportunity and believed that Dr. Phinney and Dr. Volek’s research regarding the safe and evidence-based reversal of Type-2 diabetes by a low carbohydrate, real food diet could be scaled with technology and telemedicine. 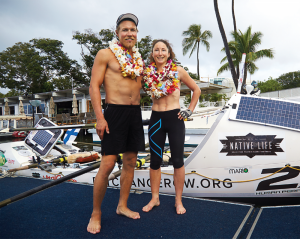 Inkinen and wife Meredith Loring after they completed their 45 day row from California to Hawaii. Sami was co-founder, chief operating officer and president of Trulia, Inc., the real estate marketplace acquired by Zillow (Z) for $3.5 billion. He is also a world-class triathlete. In 2014, he and his wife Meredith Loring rowed from California to Hawaii on an expedition called the Fat Chance Row. They set a record rowing over 2,400 miles in 45 days! Sami did a great interview with Dr. Zeev Neuwirth on the Creating a New Healthcare podcast on December 2, 2017. I also recommend Ben Greenfield’s podcast interview with Sami, How To Reverse Type II Diabetes, Create Billion Dollar Companies, Win Triathlons with A Fraction of The Normal Training Time & Much More: The Sami Inkinen Podcast. Diabetes is an epidemic. Over 30 million Americans have Type 2 diabetes and another 100 million are pre-diabetic. It’s also a worldwide problem with an estimated 400-500 million diabetics. China alone has over 100 million people with type 2 diabetes. In the United States, the average annual health care cost for a type 2 diabetes patient is $15,000. Diagnosed diabetes costs America $327 billion and one-third of Medicare spending is on type 2 diabetes treatment. Each day, 4,110 people are newly diagnosed as diabetic. Diabetes leads to vision loss, circulatory issues, and more. African Americans and Hispanics are over 50% more likely to have diabetes as non-Hispanic whites. As these patients age, they are more likely to get other chronic diseases, including cancer, heart disease, kidney disease, hypertension, and vascular disease. With these chronic diseases, medical costs go much higher. Dr. Sarah Hallberg, Principal Investigator for the Virta Study. From the beginning, Virta wanted to use evidence-based, peer-reviewed research as the basis for the company. 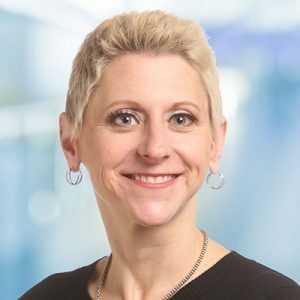 In August 2015, Virta sponsored a study, ” Dietary Intervention in Type 2 Diabetes and Pre-Diabetes,” with Dr. Sarah Hallberg of Indiana University as the Principal Investigator. Dr. Hallberg is not only a clinical doctor and researcher, but a great communicator and advocate. She gave aTedxPurdue talk in 2015, Reversing Type 2 Diabetes Starts with Ignoring the Guidelines, which has had 3.8 million views. She has done many podcasts and speeches which are available online. Another great one is Ketogenic Diet for Type 2 Diabete s, in July 2018. Of the 262 Virta participants, 238 completed the first 10 weeks and 83% stayed in the study through the end of the first year. The positive results came quickly: by 10 weeks, 57% were taking at least one less medication. At the end of the first year, 94% of those in the intervention arm either reduced or ceased insulin use! The use of other anti-diabetic drugs, excluding metformin, fell from 57% to 30% of patients. At the beginning of the study, 89% of these participants were taking diabetes medication. Sorry Medtronic, Eli Lilly, Novo Nordisk and Sanofi—all makers of insulin. After one year, HbA1c was reduced, hypertension and blood pressure medications were reduced, and patients saw substantial improvements in obesity, cardiovascular disease markers, and inflammation. The average participant lost 31 pounds. Much of the world views obesity as a disease, while Virta views weight as just one more marker. Weight loss is usually viewed through the lens of calorie restriction, which proves unsustainable. The Virta Treatment does not require counting or restricting calories—it just eliminates junk and processed foods. Weight loss is not a goal of the Virta Treatment; however, it is a likely outcome. The ADA and other skeptics don’t believe people will stay with any program. Virta believes with good food, results and support, people will choose health. The results for those under conventional care were as expected. This group had no significant improvements in HbA1C, weight or reduction in diabetes medicine. Mr. Arien Malec is SVP, R&D, Change Healthcare, and a long-time observer and commentator on many things healthcare. For background on low carbohydrate nutrition, I recommend Gary Taubes, The Case Against Sugar, Dr. Mark Hyman, The Blood Sugar Solution, Dr. David Perlmuter, The Brain Grain, and Nina Teicholz, The Big Fat Surprise. Gary Taubes also conducted a great interview with Brian Sanders’ Peak Human Podcast (Part 13, 8/13/18). Among other subjects, they discuss the science and history behind obesity and nutrition. Sanders also interviewed Dr. Noakes on Part 3. The South African nutritional establishment has taken Dr. Noakes to trial for his “heretical” beliefs about nutrition. It is quite a tale. Virta’s goal is to reverse type 2 diabetes and reduce the need for diabetes medications. Virta aims to treat people taking insulin, including those that have been taking it for many years. Those already taking medications cannot safely change their diet and medications on their own. Virta’s treatment uses an individualized approach to nutrition, considering each person’s medications and lifestyle. Virta provides a personal health coach with expertise in nutrition and behavior. They also provide a physician to oversee a patient’s progress and manage their withdrawal from medications. Virta has a team of board-certified physicians that provide round-the-clock monitoring and care, which is very different than the periodic and emergency care provided under standard diabetes care. All of Virta’s care is done in coordination with a patient’s primary care physician. Drs. 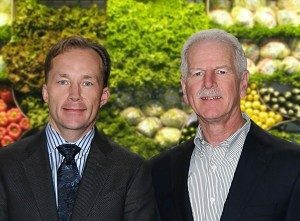 Jeff Volek and Stephen Phinney, the authors of the research that Virta is based upon. The patient receives a body weight scale that uploads data automatically, a blood pressure cuff, a meter with glucose and ketone strips, lancets and swabs. Patients are taught what to eat and encouraged to cook. The Virta medical staff provides continuous feedback and care. The Virta app provides immediate access to care and to information to help the patient make intelligent choices. The app provides recipes and meal plans. Virta recommends real, whole foods, and does not sell meals or supplements. There is no calorie counting. The nutrition guidance is based on the low-carbohydrate work of Dr. Phinney and Dr. Volek. Consuming carbohydrates makes one hungry, while fat in a diet is satiating. A patient will feel full faster. Think about all the drug and device companies trying to devise ways to curb appetites, when the answer is just to cut the sugar and carbohydrates. Exercise is not part of the Virta Treatment. Nutrition is the cornerstone. Virta had its commercial launch in 2017 and targeted enterprise partners. They’ve announced US Foods, Purdue University, the City of Lafayette, Indiana, Chicksaw Nation (diabetes is a huge concern for Native Americans), Tippecanoe County and Benefits Every World as customers and partners. Virta has activated 19-30% of eligible employees in the first year through marketing efforts to the employee populations. This is a high response and has been a pleasant surprise to these employers. Individuals can also apply to be patients by applying on the Virta website. Virta is investing in a commercial team to add employers, health plans, and government partners and payers. Virta’s website shows that it charges $500 upfront and $370 per month for the first year. Subsequent years are $199 per month, and Virta will give refunds for employees that don’t get results. The first two years of treatment have a list price of $11,768 compared to a cost of $30,000 for two years of conventional care. Yes, Virta provides a cost saving, but the real return comes from improved quality of life for patients. With its use of telemedicine, I believe Virta could earn high margins. With $327 billion spent on diabetes in the United States alone, Virta could be a very large company. With scale, Virta would be in a position to earn a high return on capital. It is not a capital-intensive business. Virta could see competition from other startups. However, I believe its technology and future scale could create barriers to entry. Established healthcare providers are unlikely to compete, as Virta is disruptive of the way hospital systems and doctors practice and bill today. There is no rush by the healthcare system to support a low carbohydrate diet, as shown by the ADA Standards of Medical Care in Diabetes for 2018 , the NIH’s Diabetes Prevention Program , the WHO’s Diabetes programme , the USDA’s food guidelines , and just about any large, established healthcare organization. Yet, society at large is in the midst of an epidemic, and Virta is showing great results. In April 2018, Virta announced a $45 million Series B round with Peter Thiel’s Founders Fund and Playground Global joining Venrock, Allen & Company, Bronze VC, Great Oaks Venture Capital, Redmile Group, Rock Health Obvious Ventures, Creandum, Caffeinated Capital, and Max Levchin’s SciFi VC as investors. Virta has raised a total of $82 million. In his book, Zero to One , Peter Thiel of Founders Fund wrote that disruptive healthcare focused around nutrition was an area of interest and, potentially, a very big idea. The Board of Directors consists of Sami Inkinen, Dr. Phinney, Dr. Bob Kocher of Venrock, and Dr. Donald Berwick, the former Administrator of the CMS (Centers for Medicine and Medicaid Services in the U.S. Department of Health and Human Services). Virta also has 6 professionals that serve on its Board of Scientific Advisors and 8 professionals on its Board of Healthcare Industry Advisors. As an investor, I’ve had the opportunity to speak with leaders in many of today’s large and very successful healthcare companies. One of the leading companies selling services and equipment to the pharmaceutical industry cited the secular tailwinds from chronic disease driving greater demand for drug discovery than ever before. Another leading company sells services to get people to comply with their drug prescriptions. I asked a senior staff member of this company, who is also a doctor, with all its data and insight, what the company was doing to help its customers not become diabetic. His answer was that people will continue to eat for all kinds of reasons that I would never understand. 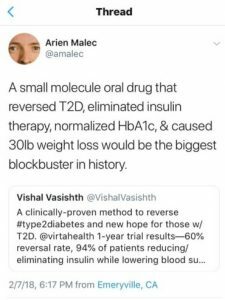 Then there’s the pharmaceutical company developing oral insulin, which it sees as the Holy Grail of diabetes care that has eluded researchers for decades. Insulin delivery today requires a needle and a once or twice-a-day shot to the stomach. 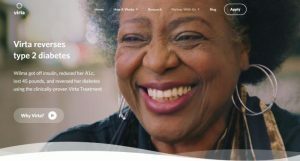 Finally, there’s the company with the big diabetes division; its goal is to have all diabetics using its “artificial pancreas” and to help patients make better insulin medication choices. I wonder, why not help people take care of their real pancreas? Virta is doing exactly that. We wish Sami Inkinen and his colleagues great success! A Novel Intervention Including Individualized Nutritional Recommendations Reduces Hemoglobin A1c Level, Medication Use, and Weight in Type 2 Diabetes, JMR, 7/3/17 in Volume 2, No.1 (2017) Jan-Jun. The information presented in this commentary is not intended as personalized investment advice and does not constitute a recommendation to buy or sell a particular security or other investments. This message is not an offer of the Needham Growth Fund, the Needham Aggressive Growth Fund or the Needham Small Cap Growth Fund. Shares are sold only through the currently effective prospectus. Please read the prospectus carefully and consider the investment objectives, risks, and charges and expenses of the Fund carefully before you invest. The prospectus contains this and other information about the Fund. Investment returns and principal value will fluctuate, and when redeemed, shares may be worth more or less than their original cost. Past performance does not guarantee future results and current performance may be higher or lower than these results. Current month-end performance and a copy of the prospectus are available at www.needhamfunds.com or by contacting the Fund’s transfer agent, U.S. Bancorp Fund Services, LLC at 1-800-625-7071. All three of the Needham Funds have substantial exposure to small and micro capitalized companies. Funds holding smaller capitalized companies are subject to greater price fluctuation than those of larger companies. Also, all three of the Needham Funds are permitted to engage in short sales, options, futures, and leveraged trading strategies. The Funds’ use of short sales, options, futures strategies and leverage may result in significant capital loss. Total return figures include reinvestment of all dividends and capital gains. Needham & Company, LLC, member FINRA/SIPC, is the distributor of The Needham Funds, Inc.